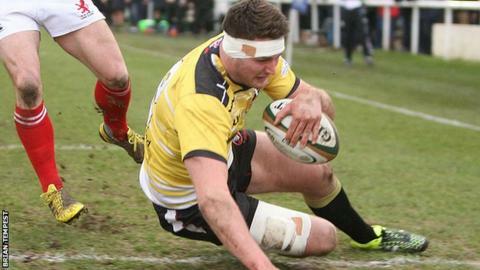 Cornish Pirates' Championship play-off hopes are over after the 21-10 loss at London Scottish, says boss Ian Davies. Pirates had led 10-0 after 30 minutes thanks to Alex Dancer's try and five points from the boot of Laurence May. But Scottish hit back with three converted tries, two coming from former Redruth forward Mark Bright, as the Pirates dropped to eighth place. "It's gone. Mathematically, we've probably got an outside chance," Davies told BBC Radio Cornwall. "But the way the fixtures lie and the other top-four sides and who they play, you've got to think that the top four's sorted, maybe not in the order they are, but they're sorted as they are. "Our focus now becomes looking towards next season. We're in the throes of trying to retain some of the squad - we're not doing it at the moment, but that's something we've got to get a handle on." But Davies says he is struggling to persuade some of his out-of-contract players to stick with the club next season, as the lure of other Championship and Premiership clubs could prove too great. "At the moment it's not happening, so we're going to lose a number of players," said Davies. "This year mid-table is where the squad is. "We've got potential, we can beat top-four sides, but we can't do it consistently, and that's the difference between the top four, middle four and bottom four. It's the depth in your squad and the quality that you can put out week after week. "We've got some holes, we know that, and we'll try to rectify that."